Raxacoricofallapatorius is another Doctor Who planet. As far as my knowledge goes, he doesn't actually visit the planet. 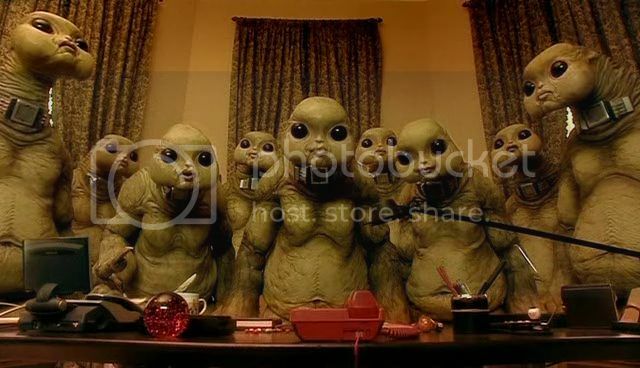 Instead, the criminal family Slitheen visits from there and enacts a plan to take control of England. It involves a space pig, which is pretty cool. Needless to say, the Doctor saves the day. Which is nice because the aliens from Raxacoricofallapatorius don't look pretty at all. Worse, when wearing human skin they fart all the time and I can't imagine it being oderless. I always thought Harriet Jones was an interesting character. You're right, she does show up here first, and the Doctor is so proud of her. But in later episodes you can tell the stress of being Prime Minister gets to her and she's making more and more tough decisions. And makes them on the other side of the line the Doctor draws. I couldn't imagine facing the Doctor's scorn, but it's hard to fault Jones's reasoning. Oh gosh yes, I'd hate to face his disappointment - especially with 10's face! I didn't saw the episode but certainly heard of those..what are they called again? never mind, these things are really creepy, from the stuff of nightmares, I wouldn't be all enthusiastic to visit thier home planet, unless with the Doctor of course. It's one of the early ones with 9 and Rose, and because it takes place in London has some nice Tyler family scenes. I always liked that about Rose's story lines, her mom plays a big part in them and says things to the Doctor that make my throat close up. I think I'm the only person on the planet—the planet called earth—who hasn't seen Dr. Who. BUT I do love David Tennant so maybe I should start bingeing the show. Starting from episode 1 LOL! That should keep me busy for the rest of my days, eh?